As the curtain rises on the charming Ambre-Cashmere family, everyone is talking simultaneously on stage — there are grunts, witty asides, chuckles, humming...and whispers delivered with a hissssss; no one is willing to ease up or shut up. We meet happy Lady Mandarin, handsome/smooth-talking General Pepper, the self-effacing Misses Violet and Iris, and bitter Mrs. Lemon, the cook (hissssss!) who brings in a tray full of tiny cups filled with hot cocoa. Chilly Cousin Clove attempts to stifle the conversation as Mr. Tonka Bean steps in to try and add sweetness and reason to the proceedings; but neither Clove nor Tonka Bean are a match for loud-mouthed / hard-drinking "Patch" who loves nothing more than creating a scene. Cashmeran (aka "CC") — as the other cast members' voices falter — gets the final, reassuring (and long-winded) speech. The End. 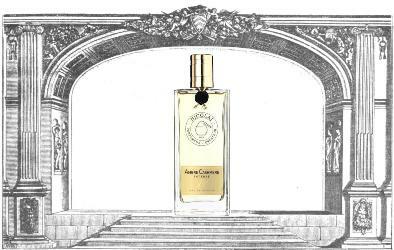 Parfums de Nicolaï Ambre Cashmere Intense's1 initial cacophony is not unpleasant...it's attention grabbing and a welcome change from the stately bergamot soliloquy one often experiences as the curtain rises on Act I of many perfumes. Ambre Cashmere Intense demands close attention to appreciate its characters. Ambre Cashmere Intense, in its early phase, produces an unsweetened cocoa-powder aroma that makes the "ambre" interesting, impure. Ambre Cashmere Intense is not a gourmand; if I ate or drank what it smells like, I know I'd get an upset stomach. On the air and on skin, Ambre Cashmere Intense smells very good. If you are a "straightforward" amber-perfume lover, you may want to either 1. look elsewhere, or 2. expand your amber perfume wardrobe in a new direction. Parfums de Nicolaï Ambre Cashmere Intense Eau de Parfum is available in 30 ml ($65) and 100 ml ($185). For buying information, see the listing for Parfums de Nicolaï under Perfume Houses. 1. Listed notes include mandarin, black pepper, lemon, iris, violet, clove, vanilla, labdanum, benzoin, tonka bean, patchouli, amber, sandalwood and musk. Note: top image Inaugural of the Salle du Palais-Cardinal 1641 - decor of Mirame - Hammitzsch 1906 [altered] via Wikimedia Commons. This may be the best perfume review evah!!! But I wish you had ended it at “The End”. Nuff said! Have you ever smelled the SSS natural Cocoa/Sandalwood? Many of the notes are similar, but unlike your description of this one, CS is extremely smooth, silky and well-blended. Not a sweet gourmand either. I’ll have to try that one…cocoa/sandalwood sounds interesting. Kevin, I’d be happy to send you a sample if you’d like. Email me at rappleyea11 with a yahoo address. HILARIOUS! I love this review. Clever! Thanks for the laughs, I really needed them! I haven’t liked PdN as much recently as I did a few years ago, but it sounds as if Ambre Cashmere Intense might be a return to form? Would depend on whether one likes Cashmeran, though. I’m not sure, whether I do or not. Mechant Loup (apparently a Cashmeran-heavy perfume) did not smell like wet dog to me, as it did to LT, but I wasn’t crazy about it, either. What a fun and very creative review! Well, maybe not bitter Mrs. Lemon. Love this brand, will definitely be trying. Flora…I do love a sassy cook…ha! Such a fun, spot-on, well-written review, Kevin. Thanks! Very entertaining review, Kevin, thanks! You get an an enabler gold star for it, too, since the ACI (such a clumsy moniker!) will now go on my “must try” list. Like nozknoz, I’ve fallen somewhat out of love with PdN, mostly since the disastrous reformulation of New York. Still… Never say never! I completely lost track of PdN releases, as well. Was there ever a non-intense version of this one? And did you ever sniff it to compare? Ann…I don’t remember a non-intense version of this one, but my overall PdN knowledge is spotty. Kevin, thank you for a moment of joy between two Excel files. Solnace…a chill went up my spine…Excel files!! Hi Kevin, Your review is so clever and very much like a fairy tale. NAC wasn’t even in my radar until I read your wonderful review. Thanks for the smile. ???? I liked how it smelled on a paper strip and bought a 30 mL from Twisted Lily last Friday – Sniffapalooza 20% off. I will wear it soon! My bottle of this arrived today and I’m wearing it on one of my wrists. I was a little alarmed the first 20 minutes or so (it was a blind buy) but after that it relaxed and came into it’s own. I totally adore it. I won’t say that Parfums de Nicolaï always grabs me with each and everyone of her creations but mostly she does. And your description of it is spot on, so thanks!